I had been watching the M*A*S*H Christmas episode where the entire 4077th staff sings this song in rondel form... a cappella (Season 7 - Episode “Dear Sis”). 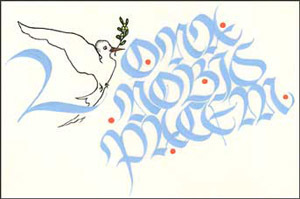 The result was this design for my 2004 Christmas Greeting. It features a dove of peace graphic that becomes a part of the capital ‘D.’ It loosely illustrates the Gestalt Theory of Perception, specifically its Principle of Closure: that an image can be mentally completed though part of the visual information is missing. The style of calligraphy used is based on the Batarde hand.